The hull has been designed by S C McAllister and Co Limited who are at the forefront of hull design. 90% of their vessels are trawlers destined for Northern Atlantic Oceans, where safety and fuel efficiency are not just desirable, they are essential. 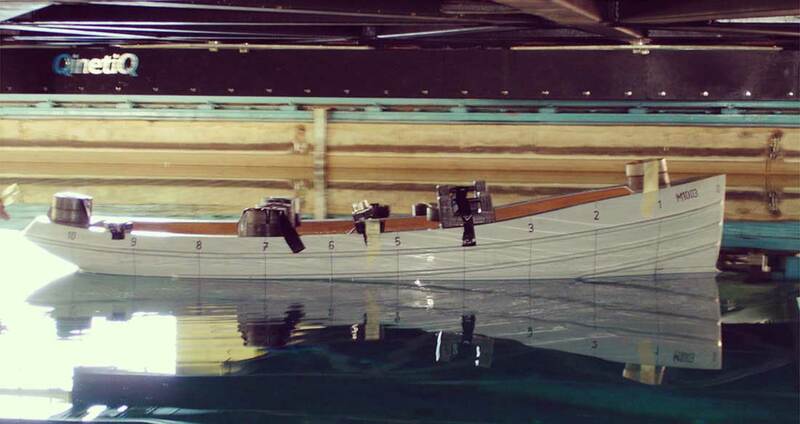 This McAllister designed hull was then subject to months of Computational Fluid Dynamic (CFD) analysis followed by comprehensive tank testing carried out by the Wolfson Unit using the ship tank at Qinetiq, the birth place of tank testing, at Gosport, Hampshire. The result is a round bilged hull with a significant bulbous bow and massive bilge keels running a third of the length of the hull. This form of hull is the most difficult to build but yields great benefit in terms of sea worthiness and efficiency.